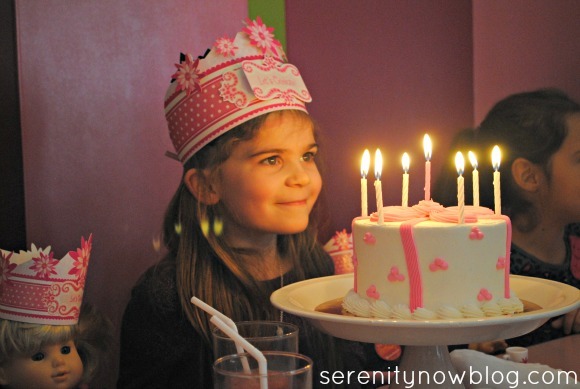 I had some emails, comments, and Facebook post requests for details and photos from Natalie's December birthday. 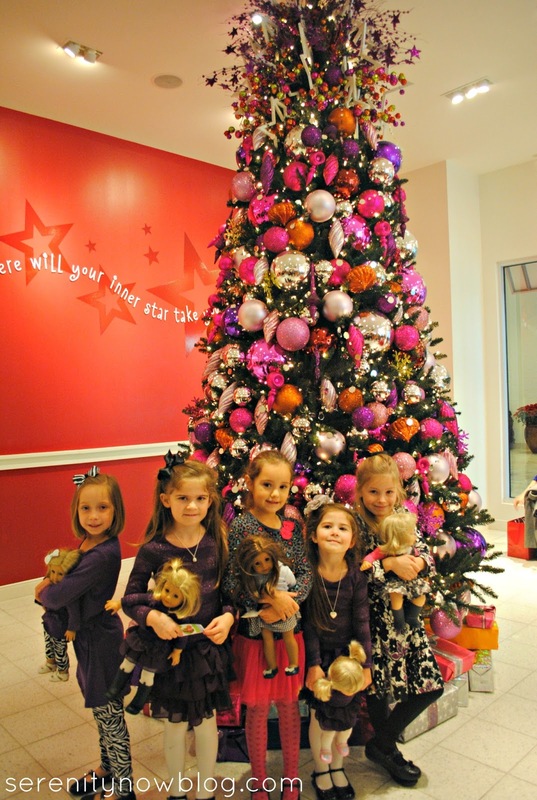 She opted to spend her 7th birthday with a few friends at the closest American Girl Store to us, which is located in Washington DC (Tyson's Corner). It was such a blast that I couldn't resist giving you all a full party review today! Here's our take on an American Girl Birthday Party. 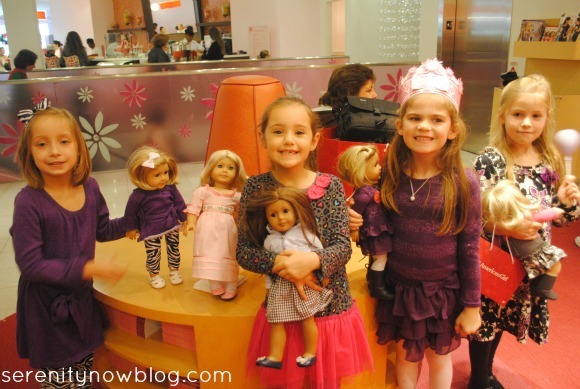 Note: This is a completely non-sponsored post, geared towards readers who may be interested in how American Girl handles events. It's a bit long, but I wanted to be sure and cover everything for those of you who asked. If you enjoy birthday party pics, you will hopefully be happy, and those of you contemplating your own AG parties will hopefully find the info. you need. The best of both worlds! I've mentioned in the past that December birthday parties are killer. I used to rush around between Thanksgiving and Natalie's birthday (on the 6th) to get the house cleaned and decorated for Christmas and a party. 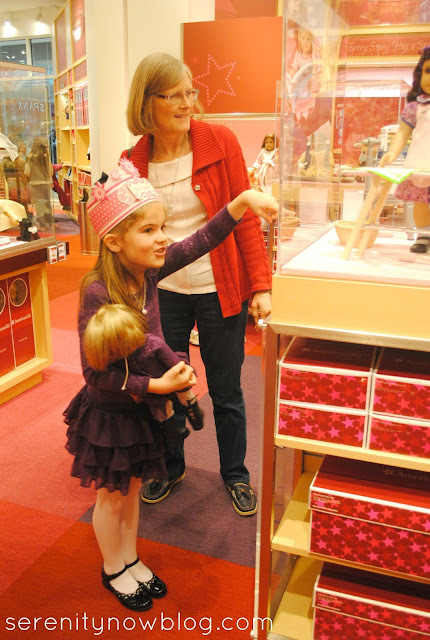 I'm sure we'll do another party at home next year, but to minimize this year's stress level, I told Natalie she could have her party at the Washington DC (Tyson's Corner) American Girl store, about an hour from our home in Virginia. She talked about it for months beforehand. Scheduling Natalie's party was simple. The only real "problem" I encountered was that in order to secure a December party slot (when so many families go on their holiday and treat shopping excursions), I had to call the 800 line in August to book the party. Yes, August. You read that correctly. 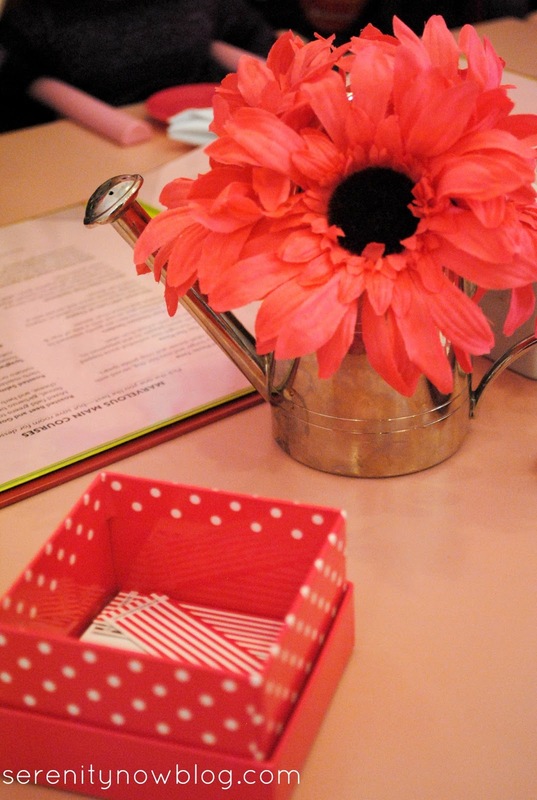 Parties and Luncheons are so popular that they need to be booked well ahead of time. I'm just glad I inquired about that early. The AG phone representative was friendly, informative, and helpful. She took my information, gave me a choice of time slots, and ran my credit card for a deposit. Larger parties require a deposit that is credited towards your party total on the day of the event. We opted for the Bistro party...for obvious reasons. The price of the party included: a drink, appetizer, lunch for each guest...and cake and ice cream for dessert! Each child received a fabulous goody bag, and the birthday girl also got a lovely crown to wear. They also sent party invitations and thank you notes well in advance. With the cost being more than what I normally spend on birthdays, Natalie was allowed to invite three little friends. And her sister. (This was non-negotiable.) My friend and partner-in-crime, Christy, rode up in the minivan with me. My mom and mother-in-law drove up together in another car. 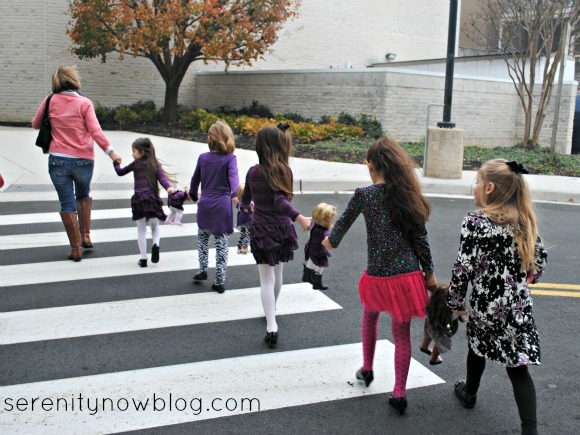 It was so nice to have extra adults on hand to navigate the busy parking lot, mall, and store. "We've arrived at the Mother Ship." They suggest heading to the Bistro about 10 to 15 minutes before your reservation to check in, so we hopped on the elevator and posed for some Christmas tree shots upstairs. We had (in my opinion) the best seats in the house, a semi-private alcove booth. I think the larger size of our party was the reason for this, otherwise we could have been at any of the open tables in the restaurant area. The booth was excellent, as it afforded us some privacy and extra space. Our server, a college-age guy, was friendly, fast, and helpful. 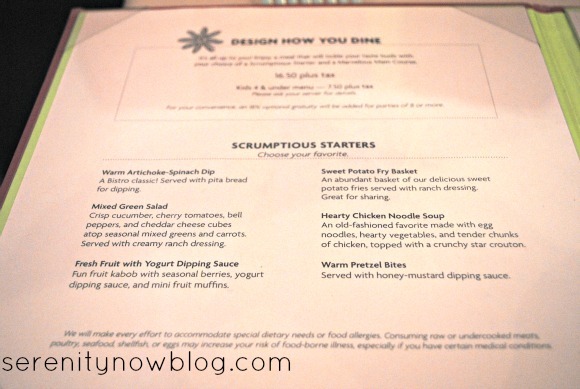 He offered great suggestions on menu selections and made sure we were comfortable. Each doll had her own seat that attached to the table. This is complimentary. 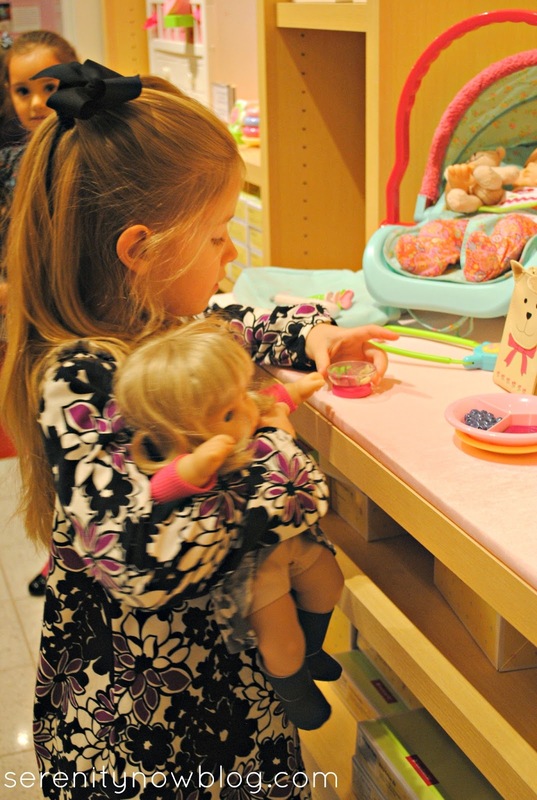 The bistro also shares dolls with guests who don't have their own with them. 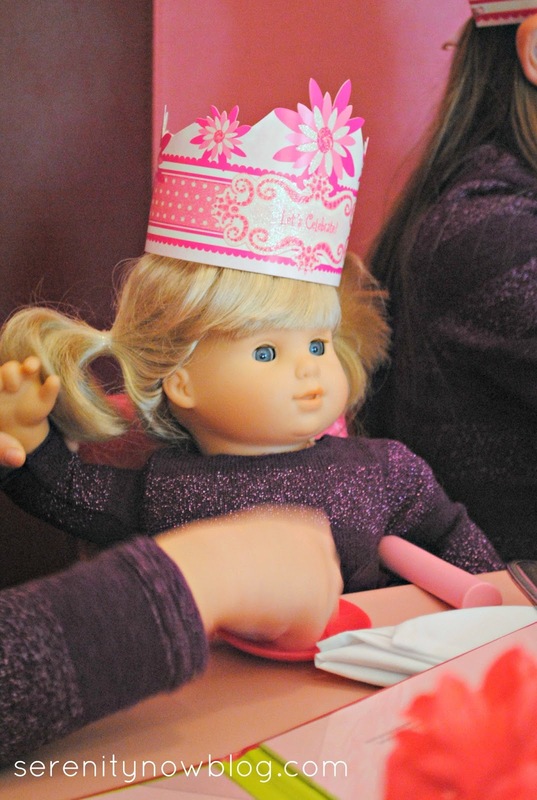 The dolls received crowns in their goody bags, and the bistro kindly lent out plates, cups, and saucers so the dolls could eat too. I'll be completely honest and tell you that I was not expecting much when it came to the food. 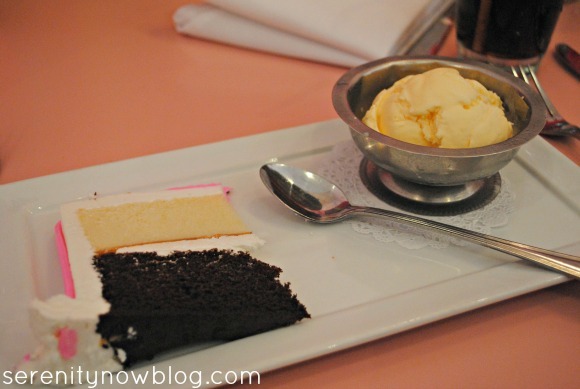 I spent some time online in the days before the party reading reviews that panned the bistro. I assumed that the meals would be on par with the "golden arches" (or worse), but I was very pleasantly surprised. 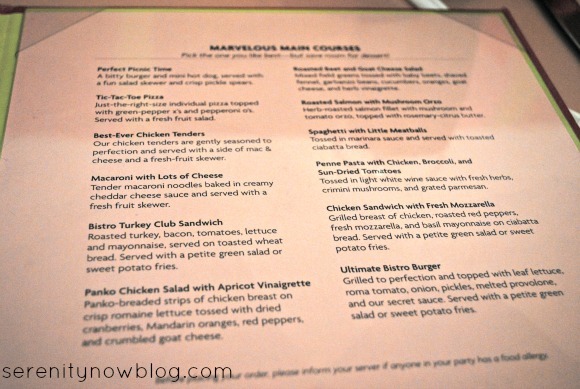 The menu had a nice variety of kid and adult-friendly choices. Servings were large, hot dishes were hot, and it was tasty. I don't know what the bad reviews were eating, but our group was very pleased with the meals we were served! My only complaint was that they ran out of Warm Pretzel Bites, which almost every guest in our party wanted to order. With such a busy Christmas season, I would have hoped the bistro management would have planned for that, as it was only 11 am. I spent some time before the party day worrying about occupying five little girls at the table during our wait for the food, but it turns out I didn't have anything to worry about. The bistro provided the most adorable boxes of conversation starter cards. 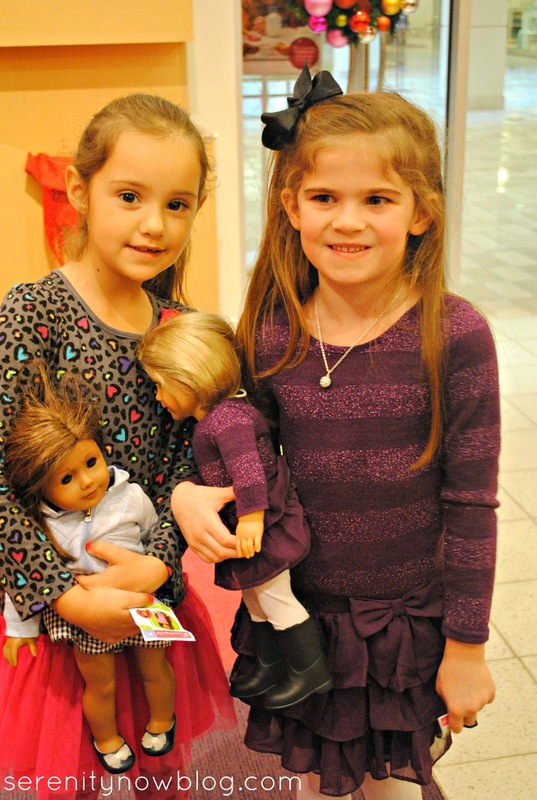 Between answering questions and playing with their dolls, the girls had a blast! And the cake. Oh, the cake! It was just lovely. Our server presented it to Natalie, while we sang "Happy Birthday." Then he whisked it off to be sliced and served with ice cream. 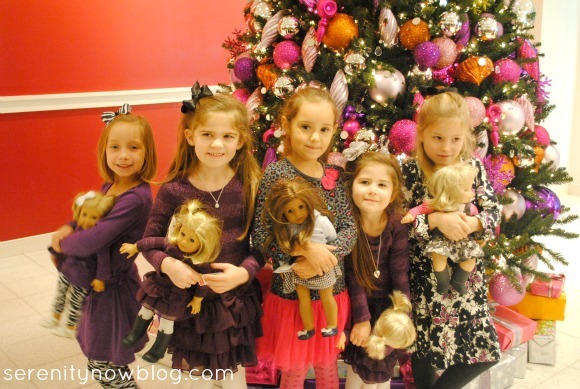 After the meal, the girls rushed over to the historic doll collections (Molly, Kit, Caroline, Rebecca, etc.) to ooo and aah over everything. Natalie had some money to spend from her grandmothers, so she took her time choosing just the right items. I headed off for a few minutes to do some Christmas present scouting for, um, Santa Claus. 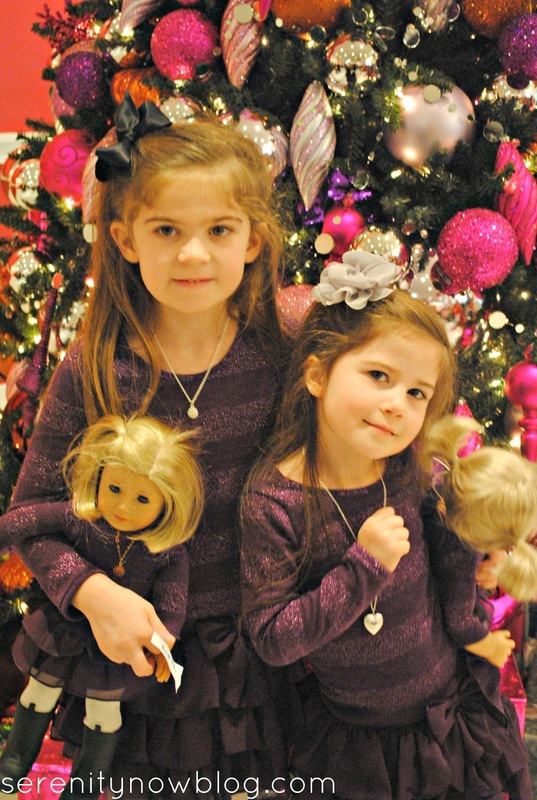 The Rebecca and Caroline dolls snuck into a shopping bag and headed home with us for a Christmas morning surprise from Santa. Was the party budget friendly? 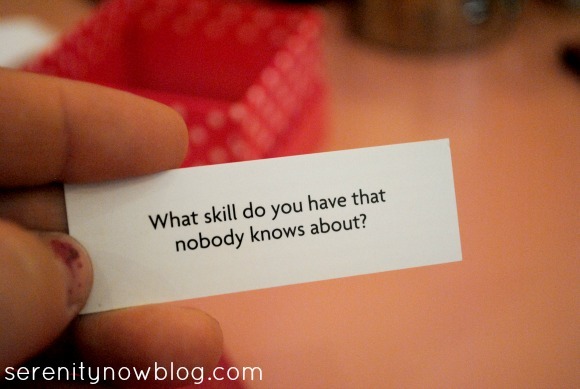 Yes and no. I spent money on gas to Tyson's Corner, an extra goody bag treat, and the bistro party itself was not cheap. But I saved myself stress and hassle, and for me...this year...it was worth every penny I had to save to pay for the celebration. 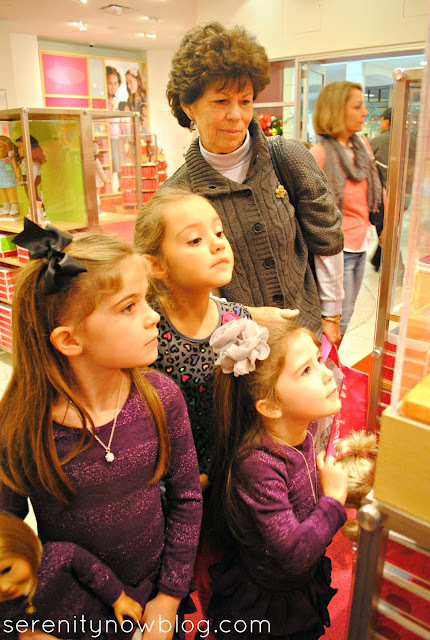 And, the excitement those girls showed was priceless! 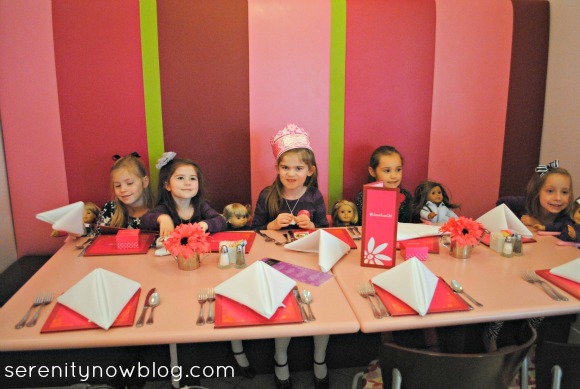 I recommend this type of party for girls ages 6 or 7 and up. 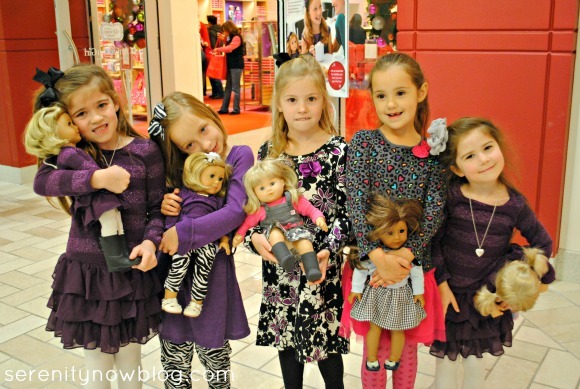 The American Girl dolls are geared towards ages 8 and older, and I think it's nice to give girls something to look forward to. 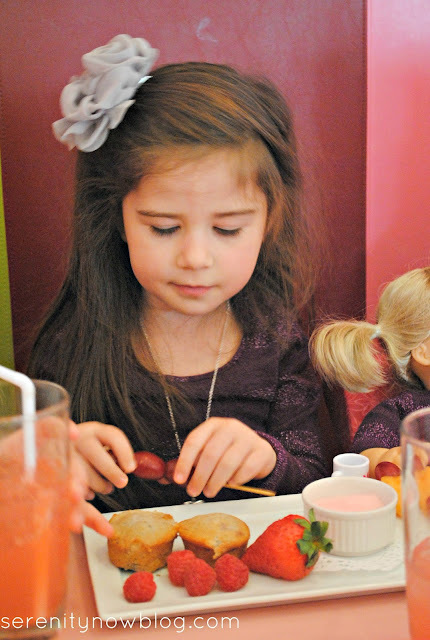 We waited until Natalie was 6 before letting her have a real American Girl doll, and she loves Kit so much that we felt like she was ready for a fancy party in the bistro at age 7. It was definitely a girlie-girl event! Thank you, American Girl, for a memorable experience for my daughter's 7th birthday. 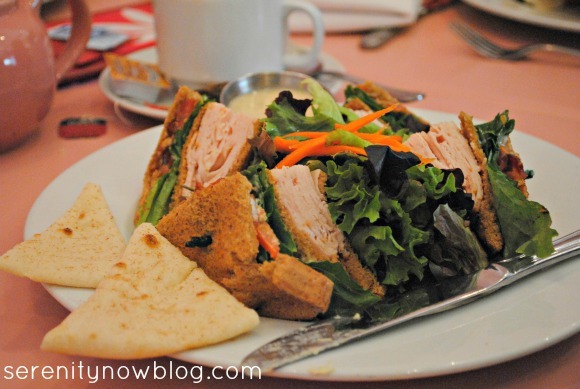 We look forward to returning for a treat in the bistro on our next trip! Do you know an American Girl fan? It looks like they do a really good job! 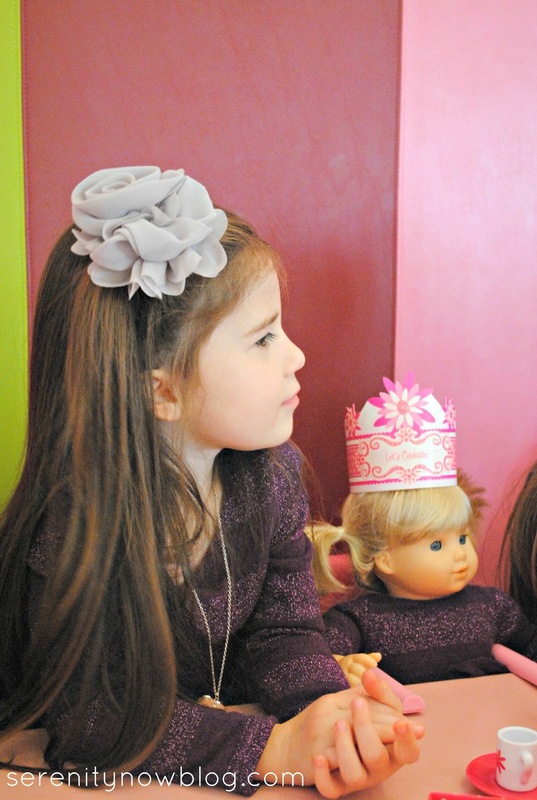 The perfect party for a little miss of 7! Looks like they had a ball! Way to go! Looks like fun! And the food looks delicious. We don't have any American Girl fans in our house, being we're in Canada. haha But my nearly 7 year old is obsessed with Lalaloopsies! Since Christmas Eve she has doubled her collection of the littles and bigs. And guess the theme she picked for her birthday party next month? lol I've already been searching for ideas on Pinterest. Sounds like such a fabulous time for the girls! We don't have an AG store here, but my girls love to look at the catalog when it comes in the mail! Sometimes I have to remind myself that time is money. And I have to decide if spending the extra time and effort to do something all on my own is worth the money I'll be saving. Sometimes it is, and sometimes it isn't. But extra money spent to save on time and STRESS during the holidays is definitely money well spent in my opinion! It sounds to me that the memories the girls will have from this party are worth every cent spent. It looks like a lot of fun for all. Amanda this was such a fun idea for a birthday party! And it was so girlie! It looks like everyone had an amazing time...and some amazing cake too! This looks like such fun. 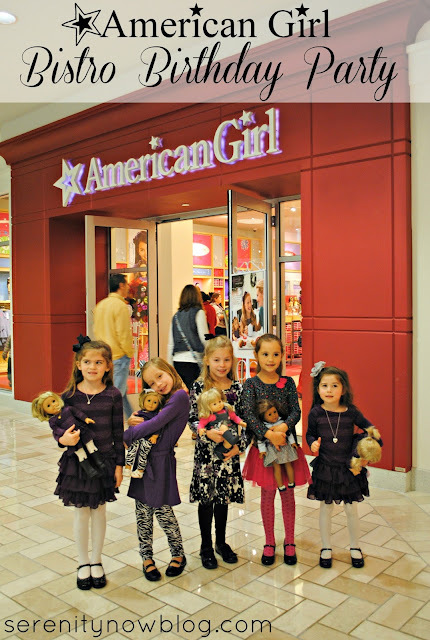 I always wants to go to the American Girl store as a kid but it was like 4 hours away and we never made it. I'm living vicariously through your girls. I'm sure I've already told you this but I have a trunk of Amwrican girl dolls and books. I loved my dolls so much. I think I have Molly, Samantha, Addy, Felicity, and the one that looks like me. I think? I should really get rid Of them but I keep holding onto them in case I have a little girl someday. 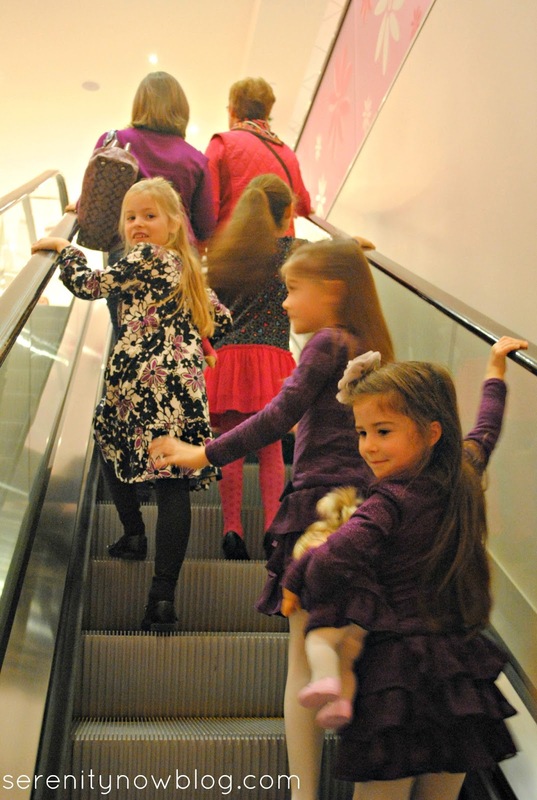 Love the photos - it all looks so grown up compared with our 3rd birthday party last Sunday. 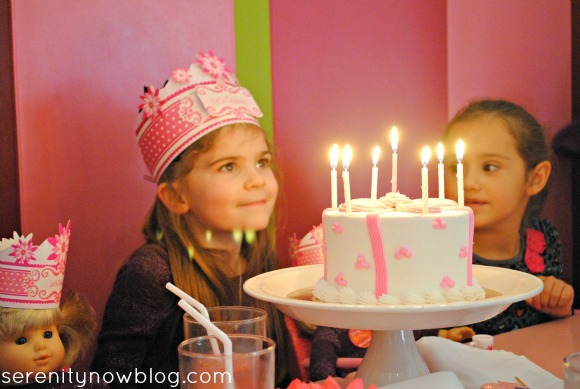 What a sweet idea for a birthday party! It looks like the girls had a great time! 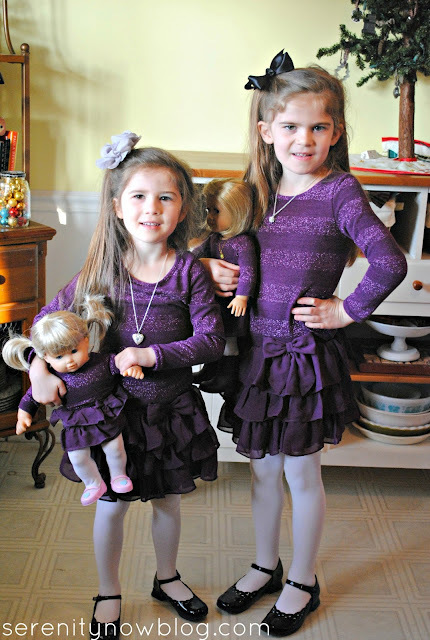 I loved their matching dresses - soooo cute! Love it! 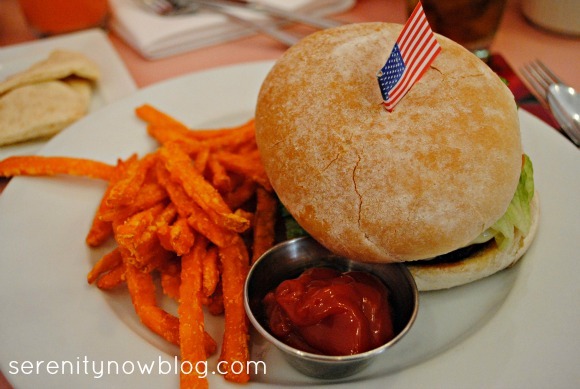 We are hooked on AG but our nearest store is 4 hours away :( Great post! 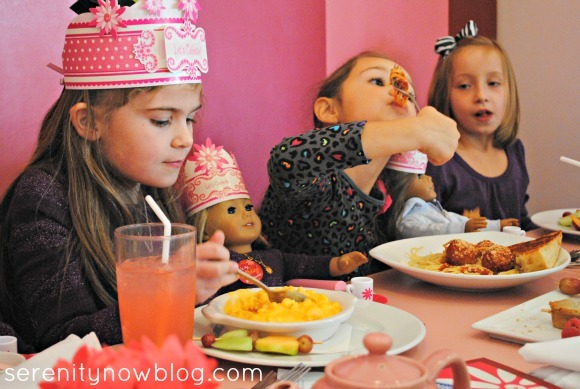 When you have a girl who is over 8 years old, can they still reserve for the Bistro Party or just the Deluxe Party? I know you posted this a while ago....but where did you get your girls' dresses from? They are beautiful! My daughter and I stop at the AG store in Dallas every time she has to see her neurologist or urologist which is about 4 times a year. 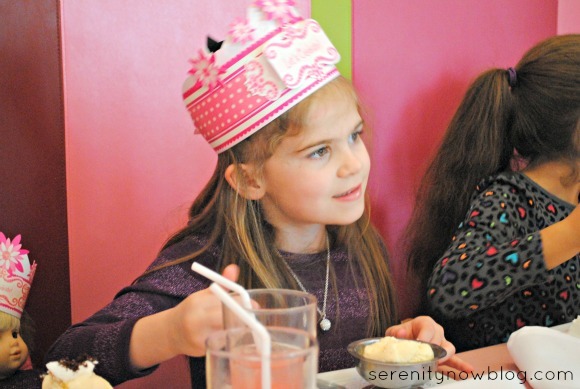 For her 6th birthday she decided she would rather have the money I would have spent on a party. I felt guilty but the AG store was able to throw a party for the two of us. She got everything a normal party would have but instead of cake she picked a dessert with candles. Do you think if I call now I would find a spot for December 7th? Thanks for this post. I am planning a small party for our daughter at this store, and this was really helpful!